Festivals of Andhra Pradesh are celebrated with great enthusiasm. Many common festivals like Makara Sankranthi (January), Maha Shivaratri (February/March), Ugadi (Telugu New Year), Sri Rama Jayanthi (March/April), Varalakshmi Vratham (August), Vinayaka Chaviti (August), Dasara (September/October), Deepavali (October/November), Deepotsavam during Deepavali time, are celebrated in Andhra Pradesh. In addition, some unique festivals pertaining to the State are also celebrated, reflecting the cultural richness of the place. Andhra Pradesh celebrates common Festivals of India like Mahashivaratri, Vinayaka Chaturthi, Deepavali, Ram Navami, Srikrishna Jayanthi, Navaratri, Akshaya Tritiya, Budha Purnima, Mahavir Jayanthi, Bakrid, Ramzan, Christmas, and Easter. Apart from these, they also celebrate main festivals like Ugadi Festival and Makara Sankranthi. 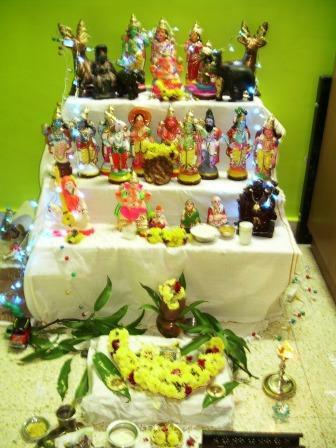 They also have certain festivals which are unique to Andhra Pradesh. Vishakha Utsav - This 4-day grand festival is held at Visakhapatnam, the port city, organized by the State Government to augment tourism in the State. This exclusive event exhibits the traditions and culture in the form of arts,crafts, music, dance and other cultural programs where the outstanding artists in the field from all over the state participate. The main attractions of this event are cultural shows, garment exhibition, traditional crafts, heritage tours, sports events and flower show. It is a perfect way to have a glimpse of the cultural heritage of this beautiful State. Brahmotsavam - This great festival is celebrated in Tirupati, one of the most visited temples of India. Brahmotsavam festival is the most ostentatious festival of Lord Venkateswara and celebrated for 10 days between September-October, every year. The festival derives its name from Lord Brahma since it was Lord Brahma who first conducted this festival at Tirupati temple. Deccan Festival- This 3-day festival is celebrated on second Friday, Saturday and Sunday of April every year in Hyderabad. Music, Dance, Theatre,Ghazals, Mushairaras, Qwaalis and Arts & Literature are prime features of this cultural festival. Pearls and Bangle Fairs are also held during this time. A visitor to this festival can enjoy the delectable Andhra cuisine, along with the culture of the land. Lumbini Festival - This festival is celebrated on 2nd Friday to Sunday of December at Hyderabad and Nagarjunasagar, to highlight and celebrate Buddist heritage of Andhra Pradesh. Rayalaseema Food and Dance Festival - This festival is celebrated in October in Rayalaseema area of Tirupati in Chittoor District, with arts and cuisine of the place. Check out this site for more information. .